Here's the model number of my GE fridge GSS25WGPDBB, where freezer seems to be fine while fridge side is between 52-56 Fahrenheit. I have tested all 3 thermistors, by leaving them in an ice cup(with some water) for 5 or so mins, while multi-meter was at 20K ohm scale. Fridge and evaporator thermistors are showing 6.9-7.xxK ohm and freezer bottom one is showing 8-9K ohm. I am at compete loss, if it's a sealing issue or a bad thermistor can cause that kind of behavior, i-e no cooling on fridge side and no ice/frost on upper coils? Fridge and evaporator thermistors are showing 6.9-7.xxK ohm and freezer bottom one is showing 8-9K ohm. I'd say scratch those thermistor reading. I don't believe your meter is not going to cut it. Looking at the evaporator it appears your box has a refrigerant leak. Let's hope not. Check to make sure your condenser fan motor is running and the condenser is clean. Condenser coils are clean and fan(to cool them off and compressor) is running. I can feel compressor is running and luke warm to touch too. BTW, thermistor readings I got it from the control board J1 connector, using Pin#5(and 2-4). Thought you said you measured it in a cup of water? With the thermistor immersed in a glass of ice ice ice cold water the olms reading should be around 24K olms. Double check your freezer temp. I'll bet it's not where it should be. Sorry to hear the condenser fan and condenser is clean. It appears you have sealed system trouble. Yes, thermistors were immersed in a cup with ice and water, while I took all those '3' measurements from the J1 connector. Using IR thermometer, I am seeing temperature anywhere from -6 to 20's Fahrenheit in various parts/sections of the freezer. If I leave water in it, it's turning into ice, so freezer seems to be functional. While fridge side is showing anywhere from 52-58. In terms of evaporator rings, if I am looking at from the front, top 3-4 aren't covered in ice/frost, rest all of them are, so maybe an initial issue for sealing system? Go shoot it again. Don't shoot the lower evap coils. Sure, just checked and 36-40F is showing for top evaporator coils where there's no ice/frost. Evaporator fan is running too. Well buddy let it run over night and check it again. You'll want to see 0 anyhow. If you do have a temp down around zero in the morning you could possible have a bad FF thermistor or air damper. If your ice cream compartment is cold and your beer compartment is warm, your condenser and all the cooling stuff are most likely working fine. If the fan inside the freezer is working fine then the most likely causes are the port(s) between the two compartments are clogged with ice. Thaw them out with a steamer or hair dryer. You can use a heat gun if you are really careful. Could be the little damper (door) that opens in the refrigerator to let the air through is not opening. Check that. If there is not cold air blowing in the top left of your fridge, something is blocking it or the return port at the bottom. So first question is: Do you feel cold air blowing through the damper? Thank you. 0F on all evaporator coils, you mean? Because top few coils have been ice/frost free from last 2 days. hank you. 0F on all evaporator coils, you mean? You want the freezer compartment reading. Not a evap coil reading. Make sure the evaporator cover is in place. Throw you a bag of peas in there or something and shoot that in the morning. No, there's no cold air blowing on the fridge side, but because of fan I can feel cold air blowing throughout the freezer side. Can you please point me about the location of ports? I can definitely check and validate them to ensure it isn't clogged/blocked. Yes, I have left water in the freezer and it converted to ice very shortly and whatever is there in the freezer - hasn't melted yet. But things are going south on the fridge(right side). If I unplug the whole unit overnight, hopefully it'll thaw it on it's own or no? 32 degrees will freeze and make ice. You want 0.
doesn't show it well. Part 426 in that. Remove the panel with the light in freezer. Look in top right corner. 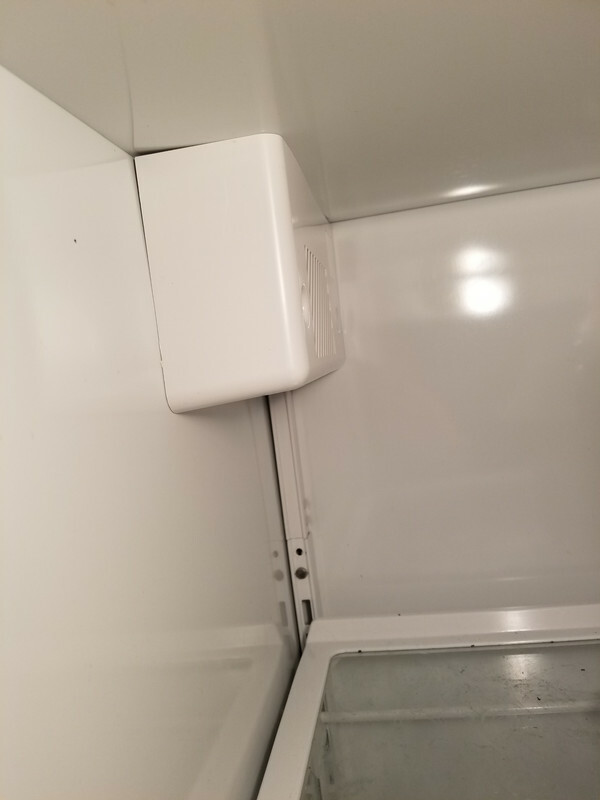 Port is on the wall between the freezer and fridge. Top of that middle wall at the back. @Tim M All yours. Appreciate you. I'm gone get drunk. If you wanted to take all your food out, and leave it open for days maybe. But we don't even know it is that yet. It could be the little damper door in the fridge side isn't opening. If your fridge is warm now, that should be open. Get back to that part 426 and see. square port visible in top left corner at 0:11 in video. Thanks to both of you. I have installed the evaporator coils cover and just turned the fridge on, both fans are running but I still don't feel any air coming out of the right side(fridge side). Maybe will let it run overnight to see if I can see a temperature difference by tomorrow morning? Yes, I have removed the ice maker already and can see a port at the top right - almost in the middle on freezer side. I touched it with my hands and don't feel any ice or cold temperature there? Should I open 429 on the fridge side, to see 426 and see if it's having issues? Thank you for the youtube link, totally understand which one you are talking about. That port is not in the middle of anything.